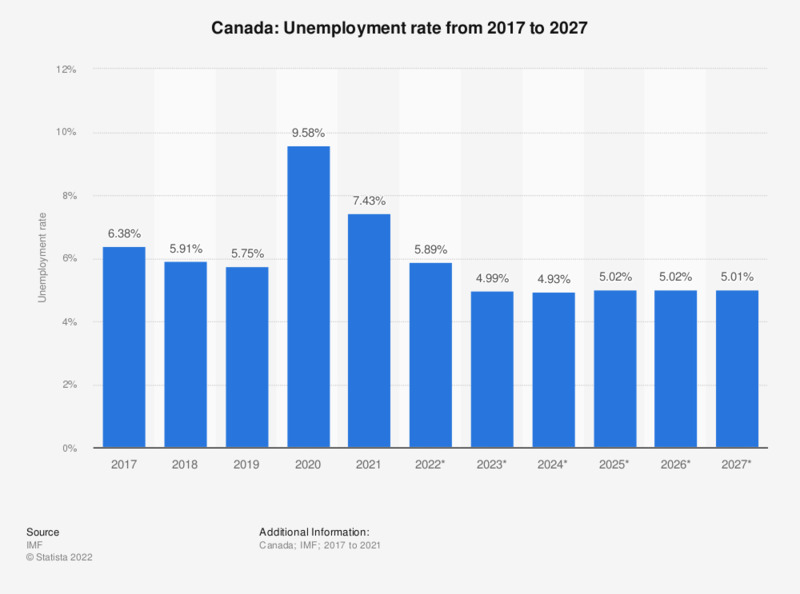 The statistic shows the unemployment rate in Canada from 2014 to 2018, with projections up until 2024. In 2018, the unemployment rate in Canada was at around 5.83 percent. Three-quarter of Canada’s workforce is employed in the services sector, with the other two sectors, agriculture and industry, accounting for the rest of Canada’s employment. The country’s main export and import partner is the United States. Although both export and import figures have increased over the last few years, the trade balance of goods in Canada – i.e. the value of Canada’s exports minus the value of its imports – has slumped dramatically since the economic crisis hit in 2008. In 2009, for the first time in a decade, Canada reported a trade deficit, and the figures are still struggling to recover. Additionally, Canada’s public debt has been increasing since the crisis. Although a few key figures are still not back to the usual level, Canada and its economy seem to have more or less bounced back from the crisis; as can be seen above, the unemployment rate is gradually decreasing, for example, and gross domestic product / GDP in Canada has been increasing steadily. Canada is thus among the countries with the largest proportion of global gross domestic product / GDP based on Purchasing Power Parity. Canada is among the leading trading nations worldwide, and an important part of its economy is the export of oil. The country hosts significant oil resources, in fact, its capacity is the third-largest after those of Saudi Arabia and Venezuela. Everything On "Unemployment in Canada" in One Document: Edited and Divided into Handy Chapters. Including Detailed References.